While finding apps amid an enormous selection can be a daunting task in the App Store or Android Market, WebOS' smaller App Catalog doesn't present the same challenges — even less so for the WebOS 3.0 TouchPad catalog, which will officially debut on July 1st. HP knows the selection will be a bit sparse, but it can still dream, can't it? Toward that end, the company is already preparing for how it will help users navigate the bursting inventory of applications it hopes to see someday via a new feature called Pivot. The idea is to showcase items singled out by HP. By spotlighting worthy apps, the company hopes to give people a heads-up on interesting entries while simultaneously assuring WebOS devs that their best titles won't get buried. Anyone looking forward to checking this out? 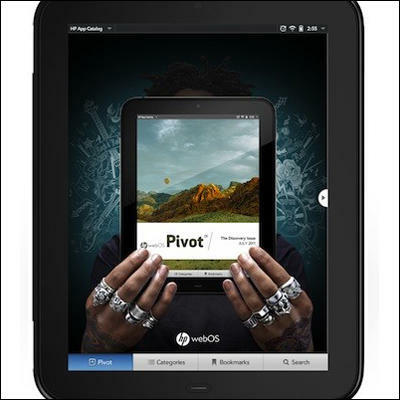 PALO ALTO, Calif.–(BUSINESS WIRE)–HP (NYSE:HPQ) today announced HP webOS Pivot, providing users an entertaining and informative editorial resource for discovering webOS 3.0 applications for the HP TouchPad, which launches July 1. "It provides an enriching experience for customers and is a great environment for developers considering the platform." Designed to complement the HP webOS App Catalog, Pivot will showcase a broad range of applications – and the developers who create them – by providing customers the freedom to explore based on their interests and lifestyles. It's just one of the new ways HP is enhancing the webOS Developer Program and investing further in the success of the growing ecosystem. "Pivot brings app discovery to a new level for customers and developers alike," said Richard Kerris, vice president, webOS Worldwide Developer Relations, HP. "We want our partners to experience webOS as the growing platform of opportunity, and we're investing in new ways to help market their applications on our platform." Published on a monthly basis, Pivot is designed to broaden developer exposure and create a dynamic marketplace for the burgeoning webOS developer community. Consisting of original content by journalists and photographers affiliated with leading publications, Pivot will include visually driven editorial pieces, columns from notable guest writers sharing their perspectives on digital culture, feature stories focused on applications around specific topics, and in-depth reviews – all accompanied by vibrant photos and illustrations on HP TouchPad's brilliant screen. Content will be catered to the specific interests and requirements of a given region, appealing to a wide range of international customers. Pivot will publish initially for English, French, German and Spanish languages and will be updated over the air directly to all HP TouchPad customers. "Pivot has the right focus," said Joe Simon, chief technology officer, Conde Nast. "It provides an enriching experience for customers and is a great environment for developers considering the platform." The webOS Developer Program enhancements also include a new discount structure. Developers will have access to this pricing model based on their years in the Palm developer program and active applications in the webOS App Catalog. "Working with HP and the webOS ecosystem has been fantastic," said Haden Blackman, co-president and chief creative officer of Fearless Studios, a game company recently started by Blackman and fellow LucasArts alum, Cedrick Collomb. "It's a perfect fit with our core values as a company – creative risks mitigated by smart technology choices. Because the platform is so accessible and developer-friendly, we've been able to build the game we want to build." "We love the TouchPad and the webOS platform for game development," added Collomb, chief technology officer, Fearless Studios. "It's built from the ground up for seamless connectivity between devices and it's an open platform, which makes development that much easier." HP TouchPad will be available in the United Kingdom, Ireland, France and Germany on July 2 and in Canada on July 15, with availability scheduled to follow later this year in Australia, Hong Kong, Italy, New Zealand, Singapore and Spain. More information about HP TouchPad is available at www.hp.com/touchpad. Complete details about the updated developer programs will be available on the HP webOS Developer Portal beginning July 1.